Former UPA Chairperson Sonia Gandhi today launched a scathing attack on the ruling dispensation, saying that the idea of India was under attack. 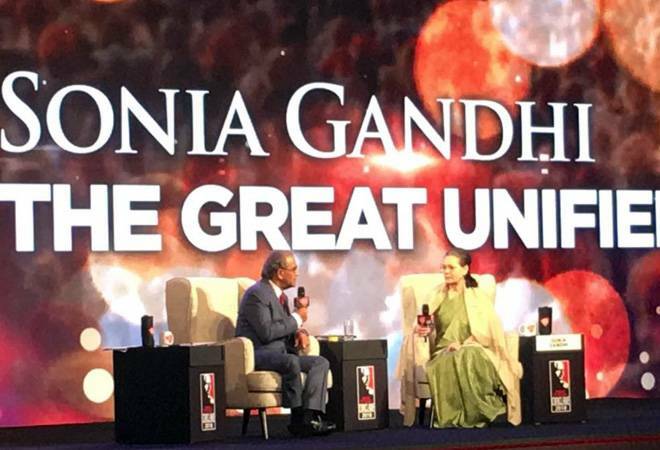 Gandhi was speaking at India Today Conclave 2018 where she said: "Callous remarks about changing the Constitution point to a deliberate attempt to subvert the very essence of India." Former UPA Chairperson Sonia Gandhi today launched a scathing attack on the ruling dispensation, saying that the idea of India was under attack under the current government. Speaking at the India Today Conclave 2018, Gandhi said, "I am confident that BJP's Achhe Din will turn into India Shining that brought us the victory." Highlighting the dissimilarities in the way of functioning of Prime Minister Narendra Modi and Atal Bihari Vajpayee, Gandhi said, "Atal Bihari Vajpayee had great respect for parliamentary procedures. Parliamentary rules are not followed under the current government." Democracy allows dissent and debate and not monologues, she added. Taking a jibe at Prime Minister Narendra Modi, Gandhi said, "Was India really a giant black hole before 26 May 2014? Did India march to progress, prosperity and greatness just four years ago? Is this claim not an insult to the intelligence of our people?" Speaking on the style of functioning of newly-elected Congress President, Sonia Gandhi said: "Every leader of a party has his or her particular style of working and Rahul has his style. I had my style. He is keen on bringing a balance of younger people and senior leaders to revitalise the party and I agree with him on this." She, however, added that Rahul wants to bring young leaders but not at the cost of senior leaders. The former Congress President said: "In the last meeting we had he clearly said that he strongly believes that young people must be brought in but that does not mean ignore senior people who have contributed a lot to the party in all these years." Taking on the BJP, Gandhi said, "Callous remarks about changing the Constitution point to a deliberate attempt to subvert the very essence of India." The former UPA Chairperson was referring to the Minister of State for Skill Development Anant Kumar Hegde's recent remark in which he had said "we are here and have come to change the Constitution." Referring to the BJP's tenure at the Centre, Gandhi said: "We should all be seriously concerned at how the foundational principles and values of our constitution are being wilfully shredded. Provocative statements from the ruling governments are not random or accidental they are part of a dangerous design." Former Congress President accused the BJP government of using the Aadhaar as an intrusive instrument of control. Gandhi was speaking at India Today Conclave 2018 where she said: "Aadhaar was to be an instrument of empowerment. It is being turmed into an intrusive instrument of control." She also said that RTI was brought-in to bring transparency and to fight corruption. "Today that law is in cold storage. The RTI and RTI activists are being killed," Gandhi added. During the short keynote address, Sonia Gandhi touched upon various social and economic subjects. She said: "The freedom to think for oneself, to differ and disagree, to eat according to one's choice, to meet and marry according to one's wishes all this and more is under attack. Our country, our society, our freedoms all are now under a systematic and sustained assault. Our freedoms are under attack." She further said that the parliamentary majority was being interpreted as a licence to stifle debate and bulldozed legislations. "Fear and intimidation are the order of the day. Alternative voices are being silenced," Gandhi added. Speaking on what went wrong for Congress in the last few years, Gandhi said that there was certain amount of anti incumbency. She said: "There were certain issues. We were in a way out marketed. We couldn't compete with how Modi went into elections." She further said that the Congress party has to develop a new style of connecting with people. The former Congress chairperson also downplayed all the talks of corruption during UPA-II regime. She said: "Corruption as an issue was highly exaggerated. The previous CAG in our government came out with a humongous sum of money. There was a problem in that. The person in-charge was given a very cushy job." The was referring to former CAG Vinod Rai who came up with 2G scam figure. "In Gujarat, the same CAG has found Rs 20,000 crore of misuse of funds and nobody is talking about it," she added. Sonia Gandhi also said that the current ruling party lacked respect to parliamentary procedures. She was responding to a question on the conduct of oppositions during the Prime Minister's speech in the Parliament after Budget 2018. "Every time there is an important issue to discuss, we are scuttled in the Parliament. We wanted to discuss the big fraud. It's the issue that's agitating people's mind. But we are not just allowed to speak," she said. Gandhi also accused the government of fuelling religious tensions. She said: "Vigilante mobs and private armies have been let loose under state patronage. There is shocking insensitivity on atrocities on dalits and women. Our society is being polarised with an eye on winning elections."